Downsizing, and selling a few special statues that have not been part of our actual altar but sat on bookcases and such, or were gifted to me. The brazier has been used (more images on another page), and we are keeping the copper one and selling this one. 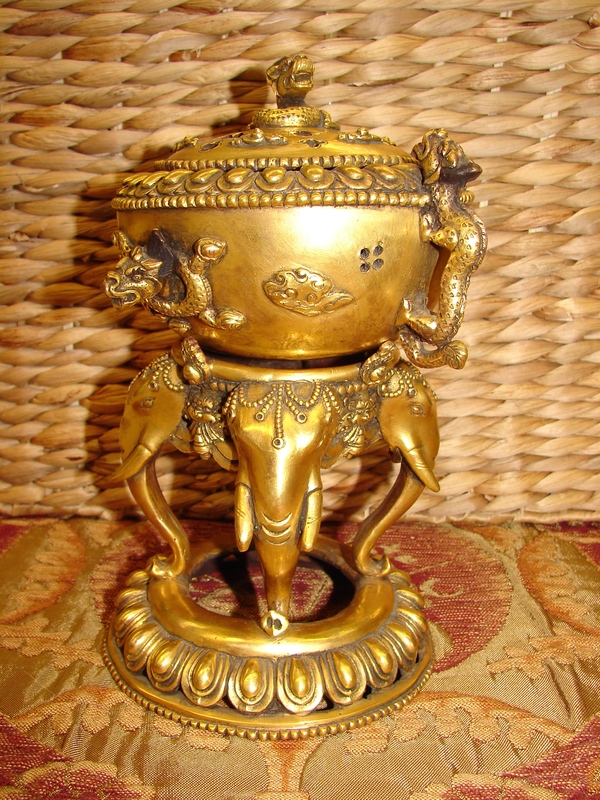 7.5-inch tall bronze brazier with lotus base, four elephant heads, fire mirrors, serpent handles and decoration, clouds create a stunning brazier or incense burner. Bowl (brazier) separates from the base, so the piece is in three parts: Base (Elephant heads), brazier (serpents and clouds with lotus decoration around top edge) and top, with serpent handle and cloud decor. We used it for incense on charcoal, and an occasional special puja. Brazier and base are not secured, and so move a bit — it has always been that way. This entry was posted in autobiography and tagged buddha, sale, statues. Bookmark the permalink. Your statues are lovely, Kate. We too are downsizing. What a job making decisions about what to keep and what to get rid of. We’ve been married more than 47 years and have collected and stored way too much. Good luck with your downsizing. Yes. Keeping sentimental statues more than the “best” statues. Sometimes things resonate deeply. We’ve done a LOT of downsizing already — but these have been sitting in my studio while we thought about it…. Good luck on yours as well! Drawing memories helps me get rid of things! Thanks. It’s quite an undertaking.